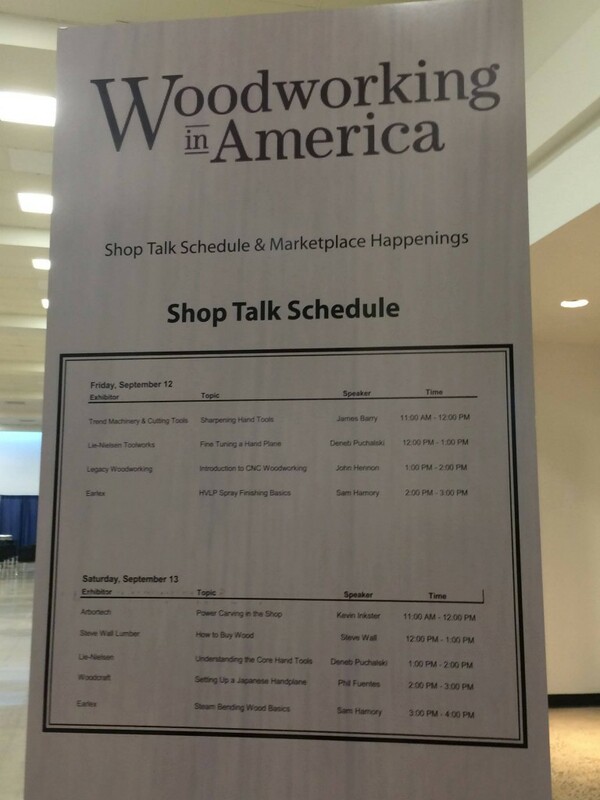 Two weeks ago I was listening to the Wood Talk podcast, and he mentioned that the next weekend there would be a great show in Winston-Salem, NC called Woodworking in America. I had personally never heard of the show but looked it up right then and there. Turns out it has been running for seven years, and is put on by the awesome folks behind Popular Woodworking Magazine. This year they moved the show to Winston-Salem and from what I can tell it was a great move. I”ve wanted to dive deeper into my own personal woodworking journey and try and build toward something more than just a weekend hobby, so I thought “why not” and headed out to the show, which was one of the best decisions I have made as a woodworker in years. If you haven”t been to Woodworking in America yet, then I highly recommend looking into attending next year when they announce the dates. The show itself spans three days: Friday, Saturday, and Sunday, with a couple different ways you can attend. You can get the full pass that allow you to attend all of the various classes and other events going on around the show, or you can just get a pass for the dealers floor. Since I was going into this on such short notice I opted for the second, and cheaper, option. I loaded into the car with my companions, also known as my parents, and we headed north from Atlanta toward Winston-Salem. We arrived in town on Friday afternoon, checked into our hotel and took some downtime to relax and do that whole family vacation portion of this adventure. That evening I had been invited to dinner by the awesome folks at Highland Woodworking to hang out and talk about all things woodworking. Dinner was wonderful; the conversations at the table ran the gamut of woodworking interests, from model making to furniture work, woodturning to carving, and everywhere in between. Along with good food and good conversation I got to meet Matt Vanderlist and David Picciuto of Matt’s Basement Workshop and The Drunken Woodworker respectively. Meeting two accomplished woodworkers and having an evening to converse and pick their brains about all things woodworking was one of the highlights of the show for me. One of the others was the excellent pizza we had for dinner. Saturday at the show rolled around and my folks and I arrived at the convention center, not exactly sure what to expect. Most of my experience with conventions comes from the comic book and animation side of things, so this would be my first real foray into a woodworking convention and boy was I in for a treat. Stepping through the doors, I was greeted by what I can only imagine a piece of heaven for woodworkers might look like. There were rows and rows of booths, all filled with things that caught the eye: hand tools, power tools, and the products they can be used to make, stretched out in all their shiny perfection before me. It was a beautiful sight to behold and I eagerly began my exploration of the show floor. Walking the floor could have felt overwhelming if it wasn’t for the people in the booths. The first thing I learned about the show is that everyone there was eager to talk to everyone else. Each and every booth I passed had staff who were willing to stop and spend time talking to anyone that walked by. If you have ever experienced a convention where the people in the booths look at you with dead eyes and no interest then you would have been as surprised as I was by everyone at Woodworking in America. Not only was I talking with the vendors at the Saw Stop booth, or the Micro Jig booth, I also spoke with amazing woodworkers like Scott Meek, and Peter Galbert as well. 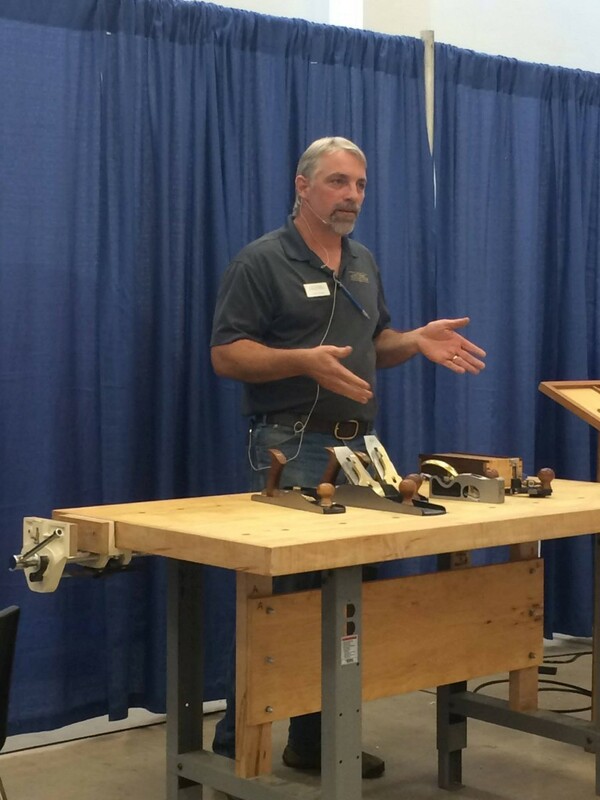 When you can stand around and listen to Scott Meek talk about his wood bodied hand planes, then talk to him about their construction, the design, and how he uses them in the shop, you know you are at a great show. But talking isn’t the only thing I was able to do at Woodworking in America. If the conversation was one half of what made the show great, the other half was the ability to get hands-on with all of the various tools. The booths at the show were almost all interactive in some way. The vendors and tool makers were eager to show you how their products work but were almost more eager to have you test drive them yourselves. I personally got to use some fabulous planes at Scott Meek’s booth, at the Japanese Hand plane booth, and at both Lee Valley and Lie Nielsen’s booths. 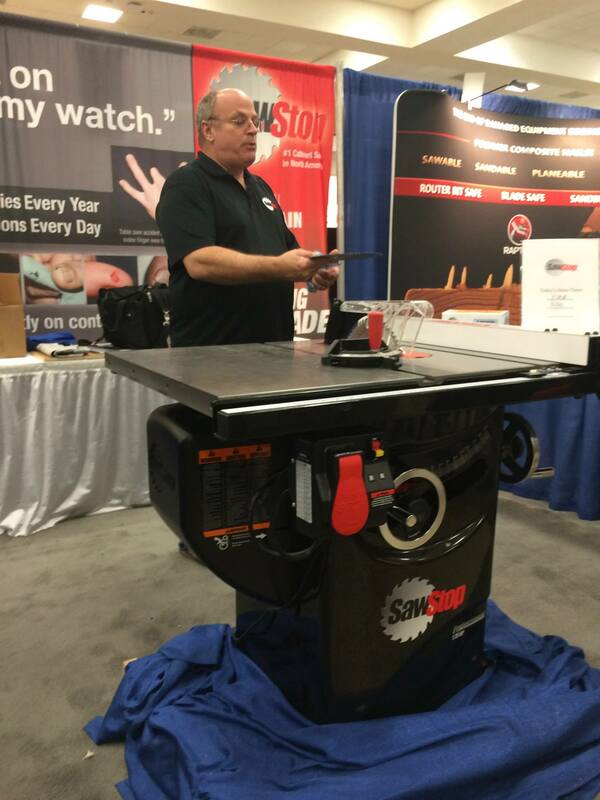 If you couldn’t get your hands on a particular tool at this show, the vendors were often eager to show you every in and out of the product themselves. The final aspect of the show that I should mention was the class offerings and talks. Since I was unable to get one of the full passes to the show, I was not able to sit in on any of the big classes, but I stuck my head in the door to a few and they looked to be well worth the price. The class list was expansive, covering topics like French Marquetry, Southern Gothic style woodworking, Japanese hand planes, Table saw joinery and so much more. However, even with just the marketplace pass, I still had access to some amazing talks. One corner of the show room floor was dedicated to a small stage and presentation area. There I was able to attend several talks and conversations with many woodworking luminaries without needing to spring for the full pass. The hands-on nature of the show and the interactivity of the floor really brought home to me just how different Woodworking in America is from some of the other conventions I have attended in the past. 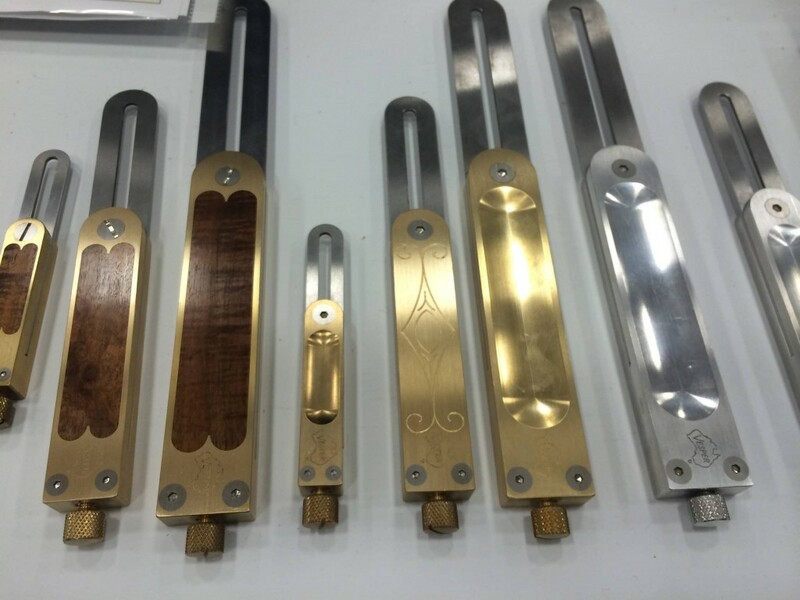 All around were people who were passionate about woodworking; every step I took on the convention floor brought me to some other conversation about woodworking. The atmosphere was so full of passion and a willingness to share knowledge that I left the show feeling invigorated and inspired. Walking in the door to Woodworking in America, I never would have thought I could spend an hour talking about chair carving, or get lost in a conversation about wooden hand plane construction. The show really made me appreciate being a part of the wonderful woodworking community. Every person I met at the show, whether they were a fellow attendee or someone like Matt, Scott, or even Roy Underhill, still took time to talk about woodworking. Within that space, everyone was equal. We all shared a passion for the same thing and I feel we all came away better for it. 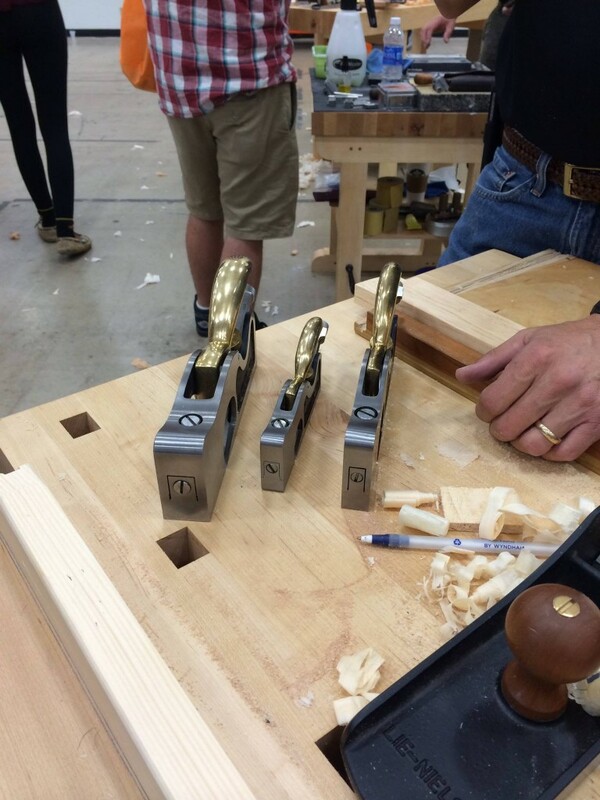 If you get a chance, attend Woodworking in America next year. If you have any sort of passion for this craft, you will only leave the show inspired and eager to work some wood. Woodworking in America 2014: Getting Ready!